Stop wasting your time, girl. 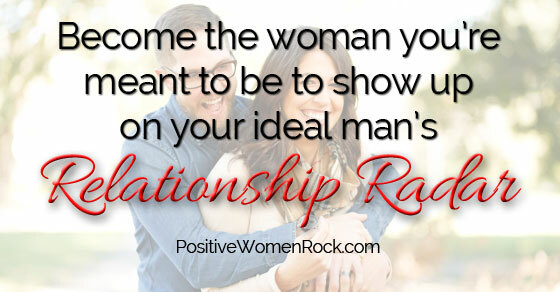 Most women look for their epic love but don’t show up on their ideal man’s relationship radar. And there’s a very good reason for that. If you are looking for an amazing man with all the qualities on your list (yes, I’m a big believer in making a list of exactly what you want in a man and relationship), you need to ask yourself if you are currently the type of woman a man like that is looking for? I see women daily who are bitter and angry, with toxic attitudes and several relationship coaches under their belts, who are still miserably single. Is that really the kind of woman an awesome man is looking for? NO. Here’s the deal. A man of your dreams is looking for a woman of his dreams, and you must be that before he will even notice you. It’s like tuning into a radio station. If you are on different frequencies (energetically speaking, which is how the universe works), he can’t see you. And you see everyone BUT him in your search, which makes you feel more hopeless and lonely. Is your emotional life a royal mess? Do you lack self-confidence because of the heavy toxic baggage from past relationships you have in tow? Are you seeing stress over your lack of a good relationship (because you are not yet ready, emotionally) manifesting in your less-than-stellar physical health and weight? Are bitchy social media comments that scream anger and insecurity part of your day? Or maybe they are laced with unhappiness and despair? It’s okay if you are currently a mess. We’ve all been there, done that, and have the t-shirt to prove it. You’re in good company. And there are ways to get on-track and become the woman you’re meant to be, and rock your self-confidence much quicker than you think. You just have to own your messiness first, and then take action. The first relationship to build BEFORE you date is the one with yourself. You must become a complete package of confidence, fun, and happiness ALONE. And realize that “alone” and “lonely” are very different. You can be happy when you are alone and still truly want a relationship. But loneliness is dangerous to any future relationship, in my experience. It wreaks of desperation and take-the-first-guy-who-comes-along-ness. In fact, one of the synonyms for lonely is deserted … ewe! That’s attractive (and that’s sarcasm). The awesome man of your dreams won’t be saying, “Oh, I want that deserted girl over there in the corner! She looks like a keeper.” But an insecure narcissist or abusive man will… in a heartbeat! When you can be your own best friend and have good girl friends with healthy, positive attitudes, you are well on your way to attracting a magical romance with a man who’s values you actually possess. So, if you are looking for your epic love relationship, Stop. Dating. Men. Now. As women, we tend to ask more questions of a potential relationship prospect in the first three dates than we ask ourselves… EVER. No question a man ever asks you about yourself should leave you baffled. Having a healthy relationship with yourself means you have already asked yourself those same questions and know the answers before you date. 1. What are your values? Do you currently possess them yourself, or do you let yourself off the hook but want them in other people? If your life is already aligned with your values of integrity, fun, laughter, and passion, you are well on your way to meeting a guy with the same. If not, pay attention to whatever in your life doesn’t line up with your values. Do you need to delete a toxic frenemy who throws you under the bus or is never there for you like you are for her? Do you need to change jobs to avoid the boss bully who makes you feel small but pays well? 2. What lights you up inside? What is that thing that gets you on an emotional high even when the rest of your world crumbles around you? If you don’t know yet, it’s going to be very difficult when the person you’re depending on to hold you up falls and needs your support. So, ask yourself, “What is my go-to to get back on-track and feel good quick?” Do you write down all the things you are grateful for, hike, run, pray? What is it? 3. How do you handle your own mistakes? If you beat yourself up, you’re not ready for a healthy relationship with someone else yet because you don’t have the self-love that requires. If, however, you learn the lesson, apologize when warranted (only when warranted as opposed to over-apologizing which screams insecurity), and move on stronger and stronger, you’re on your way! Look at mistakes as win or learn rather than win or lose propositions. 4. What are your dreams for your future? Do you have a plan or are you in a holding pattern waiting to fit into your future man’s plan? If you don’t direct your life to reach your full potential, other people will be happy to use you to reach theirs. You deserve better. Know where you’re going with willingness to change direction as long as your values stay intact and your life expands instead of contracts. While there are many more questions to ask yourself to get in touch with who you really who you are and what you want, these are a good start. That man you are looking for is looking for you. You both just need to be on the same energetic wave-length to see each other. Think of things you got years after you first started wanting them. The ones you realize you were not ready for back then. It would have been a disaster. Timing is always perfect, you just may not know why what you want isn’t delivered on your preferred timeline, but you will. It’s the lessons and the personal growth you need to have before that thing you want can be as successful. Everything up to this point has created you to be ready for that epic love you so desire. Believe it. 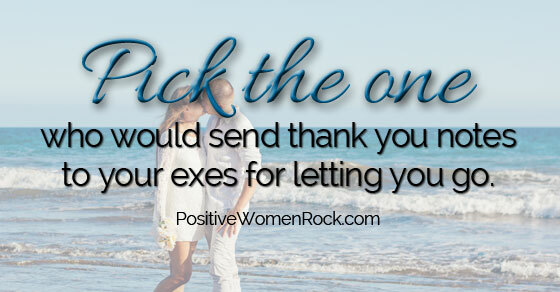 You need to meet a man who sends all your exes thank you notes for letting you go so that he could have you. Because you are just that awesome! Kelly Rudolph, founder of PositiveWomenRock.com guides women quickly from stuck and stressed to clear and confident for the life, love, and health they truly want. Get her free Life Strategies now. Read this article on YourTango.com.